As a wife, a mother of two, a teacher and a student, balancing the struggles of staying fit and raising a family can prove to be quite a challenge. Every year, I spend the majority of my “Me-Time” training and raising money for The Young Survival Coalition. For three days and 245 miles I will ride my bicycle and raise over $2500 to make sure that no young woman ever has to face breast cancer alone. The survivors and fighters I ride for ensure that I am out on my bike and motivated despite whatever obstacles are in my way. When I first arrived at Tour de Pink I did not know anyone. After walking into the lobby fashionably late, a kind rider in kitten heels welcomed us warmly and grabbed our bikes to bring them to check in. Five minutes later I had a new family; the Tour de Pink family. I had no idea when I signed up just how much meaning and purpose this ride would bring to my life. During dinner, my dear friend and team captain Tony Dean gave a speech that would forever change my life. He described a difficult year that he had and that throughout that year there were so many reasons to NOT ride. “There are plenty of reasons not to ride” he said, but more importantly “the reasons TO RIDE outweigh all the negative”. I looked across the table to where my new friend Gina, a survivor and mother of 3, was sitting. As tears poured down her eyes I looked at her and thought to myself “This is why I ride”. This year I will be participating in my fifth Tour de Pink. I know as my training commences, the excuses will come up on why I shouldn’t ride. There’s work, school, family, even just laziness. Then, I look at my friends who are survivors and I understand the magnitude of why I am riding goes beyond just me. There are plenty of reasons NOT to ride. 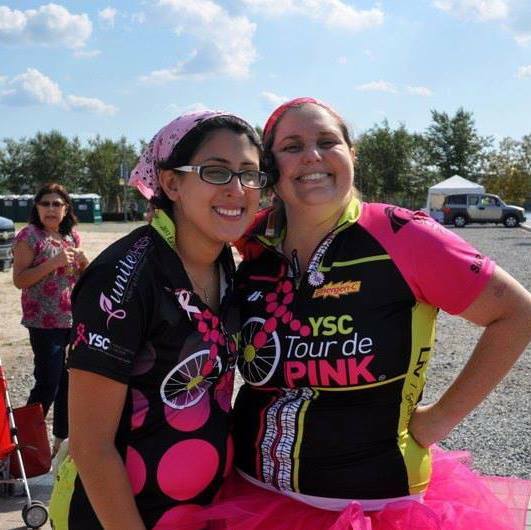 The reason I DO ride is so young women feel empowered in spite of a breast cancer diagnosis. I ride for the women I have met who are newly diagnosed and scared. I ride for Gina O’Connell, my friend and my inspiration. I ride for Kayla Falcon who lost her battle early but dedicated every day of her life to being happy. I ride for the families of these women. I ride for Shilpa, my friend and childhood mentor who lost her battle 5 short months after it began. Continuing to ride and to use my love for cycling to help others will be on my annual agenda as long as I am healthy and able to ride. If you’d like to donate to Christine’s campaign for the Young Survival Coalition, click here!